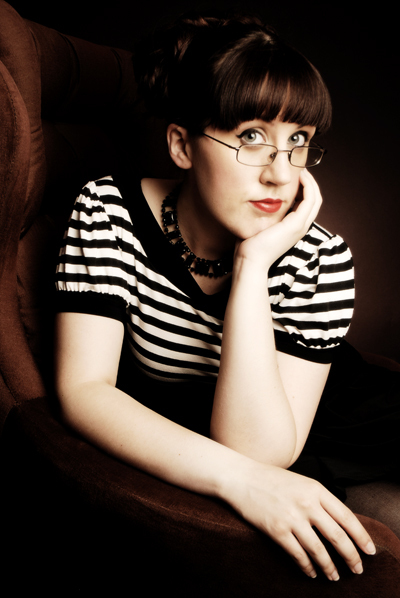 I'm pleased to have a guest blog today by the talented UK writer Icy Sedgwick. She's been working like crazy lately, finishing up a new book and revisiting the book she had published last year by Pulp Press. For this blog, Icy tackles one of the subjects that makes even experienced writers queasy: how to promote the book after it's out. A lot of writers like to discuss their writing processes, which often involve how many times they talk to their muse per day, how much coffee they consume, or what software they use. It's all very interesting and I love reading about how the writing experience changes from person to person, but what many writers rarely cover is their promotional processes. How do they get their books out there in front of people? If my Twitter feed is anything to go by, then some writers feel that a link to the Amazon page posted every hour is good promo. Others try automated direct messages. Other writers try strategies that are more likely to work, such as giveaways, blog tours, promotional events and good old-fashioned word-of-mouth. So what exactly do I do? My pulp novella, The Guns of Retribution, came out for the Kindle on 10 September 2011. Looking back, I really don't think I did as much promotion as I could have done. I tweeted a few links, posted links on Facebook, and answered questions on my blog. Not really very impressive. As its first anniversary rolled around, I figured I'd do something more. After all, the paperback came out two weeks after the e-book, so I decided to hold a two week celebration of the book, and its genre, on my blog and I can pretty much pin down what I did to five things. This is my fifth guest post for the period. So far, I've discussed pulp as a genre, the challenges of writing a Western, why the genre appealed to me as a UK writer, and how the character of my protagonist, Grey O'Donnell, evolved throughout the whole writing process. I haven't wanted to just sit there saying "This is my book, buy it" so I've tried to make the posts into discussions about topics, and hopefully discussions that other writers can take something from. Even if you don't buy my book, but you're inspired to try writing a Western story, then that's still something positive. I suppose I’m not just advertising The Guns of Retribution but also the Western as a viable genre. If someone has never read your book, posting a free story to introduce them to the character can be a good way to whet their appetite. Grey appeared in a Christmas Friday flash last year but I decided to use the two Fridays within my two week period to feature stories about him. The Bounty, posted on Friday, told the tale of how he got into bounty hunting in the first place. Mahko, to be posted this Friday, tells the tale of how Grey first encountered his Apache sidekick. Sometime last year I wrote three interconnecting stories based around the fabled Dead Man's Hand, the hand of cards that Wild Bill Hickok allegedly held when he was shot in the back in a Deadwood saloon. The first story tells the story of Edmund Rothers, an English gambler murdered by Blackjack Bud Hudson. 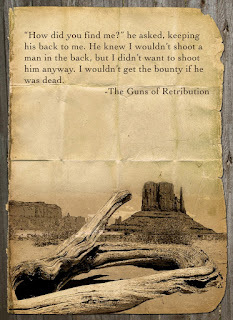 Hudson is the man that Grey is hunting in The Guns of Retribution, and I thought making the stories available would be a good way to give some backstory for those who've read the book. I also included the first chapter of Guns as a sample for those who haven't. I wanted Dead Man’s Hand to be a free download but Amazon wouldn't let me make it free for any longer than five days, so the book can be downloaded as a Kindle file, an epub or a PDF from my website until Monday. 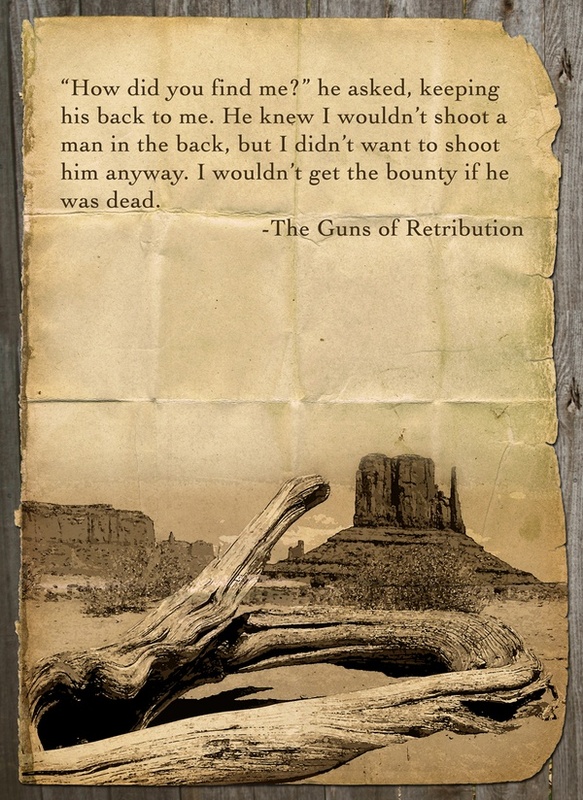 I spent some time selecting quotes from The Guns of Retribution, and then I created 'quotes pages' with them, giving them an Old West feel and illustrating them with Western imagery. They're easy to repin, they're quick to view, and hopefully they'll spark some interest. So far I only have four on my board but I'm planning to create more. Some writing blogs question the wisdom of posting quotes out of context, but I decided to turn them into slices of visual design, so hopefully it'll work. For each of the posts on my blog during this period, I've been adding my own graphic. I'm not just branding the book, which has already been done, I'm actually branding the posts as belonging to the book. It's a way of signposting the blog but also highlighting that the post is about The Guns of Retribution and its first anniversary. You need to really own your little section of cyber space and by branding your posts, you create a narrative for your blog, and for your book. In advertising they'd call this brand awareness, and it's not really any different if you're a writer. Obviously these are what I’m trying out and I won’t know for a few weeks whether or not they’ve been successful, but feel free to try them out yourself. But what other tools or techniques do you use within a promotional context? Bio – Icy Sedgwick was born in the North East of England, and is based in Newcastle upon Tyne. She has had several stories included in anthologies, including Short Stack and Eighty-Nine. She teaches graphic design and spends her non-writing time working on a PhD in Film Studies. 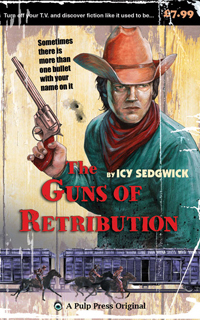 Icy had her first book, a Western named The Guns of Retribution, published through Pulp Press in September 2011. An interesting post Icy - thanks for sharing. One of the things I have tried to is to post videos of me reading short excerpts from my novella. People seem to like them, whether they actually get you more sales or not, I cannot say. Promotion seems such a fine line between getting your book out there and noticed and not driving everyone crazy with one's posts. Something I'm trying to work on. I think one of the key things is letting the book sell itself, if you know what I mean. So readings of the novella is a great idea because it's a free way for people to sample to contents. That's why I decided to get Grey to narrate another Friday flash since he's better qualified than me to sell the book! SM Reine told me how to make a book free on Amazon: offer it for free on Smashwords, then wait for Amazon to find out. It takes a few days, but it'll get there. You might speed up the process by getting friends to click the "found a lower prince" link on the book's Amazon page. I do think short stories are the way forward - people who might not have read Guns have loved the two flash stories so who knows, maybe it'll translate into more sales.